Samsung Electronics H.K. Co. Ltd. is delighted to announce the grand opening of its new Executive Briefing Center. Situated at Enterprise Square III in Kowloon Bay, the Executive Briefing Center features multiple vertical zones where Samsung displays its diverse SMART business solutions, inspiring customers to deploy technology in creative ways to address their specific needs. “As a world-renowned leader in technology, Samsung leverages its consumer-market success to offer tailor-made SMART business solutions for different industries. 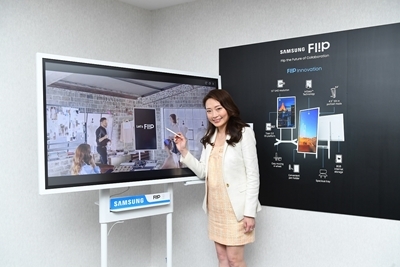 Samsung Executive Briefing Center exhibits solutions that best suit specific business needs, inspiring corporates in various industries to apply technology to elevate business productivity and competitiveness,” said Ellen Fu, Vice President, CE & Enterprise Business, Samsung Electronics H.K. Co., Ltd.
Samsung has always been providing diverse and innovative SMART business solutions to elevate businesses from a wide range of industries to a whole new level. Samsung Executive Briefing Center comprises various vertical zones for enterprises to explore the innovative application of Samsung SMART business solutions for various industries. The themes of the vertical zones include hospitality, office, retail, food and beverage and art gallery. Introduced at CES 2018, the digital meeting solutions WM55H (55 inches) and eBoard QBH-TR (65 & 75 inches) are now launched in Hong Kong. The Flip and eBoard allow businesses to spark creativity, raise productivity and enhance collaboration efficiency. The Flip WM55H (55 inches) gets rid of the typical meeting troubles around discussion, sharing, brainstorming and summarizing. It boosts productivity by digitalizing meetings. With The Flip, users can use the provided pen or their fingers as a writing tool to express their opinions freely on the Flip. The Flip can be synced and connected with user’s mobile devices or notebook computer to share content. The Flip also supports functions including encrypted sharing, online search and simultaneous writing. eBoard QBH-TR (65 & 75 inches) offers a versatile, all-in-one arena for improved collaboration. Enhanced by touch technology, the intuitive MagicIWB S5 solution and UHD picture quality come together to boost productivity and collaboration by facilitating engaging, efficient interaction. Users can freely switch between multiple screens, such as the whiteboard, internet browser and connected input sources. QBH-TR also supports functions including encryption, sharing and simultaneous writing. Up to four users can write simultaneously using the provided pen or virtually any other tool. The ultra-high resolution ensures all notations and introduced content are clear and legible for every participant. QBH-TR is easy to use, it boosts productivity as well as facilitates engaging interaction. Other than office, eBoard QBH-TR also introduces its interactive learning environment into the school, promoting an interesting learning experience to teachers and students. With the new SMART QLED Signage QHH Series, Samsung has introduced high image quality and efficiency for businesses. Businesses can customize the displays to meet their unique operational needs and reach the widest audience possible without any added hassle or expense. The SMART QLED Signage QHH Series is ran by the Quantum Dot Technology. It elevates the traditional content experience with a more lifelike quality guaranteed to deliver an unexpected viewing environment that resonates. The SMART QLED Signage QHH Series can showcase more than one billion colors at 100 percent color volume, and produce deep blacks, pristine whites and sharp hues that make any picture pop. Samsung’s QHH Series displays deliver the enhanced brilliance, detail and realism necessary to cut through the clutter, fueling audience engagement and to drive sustained business growth. Samsung QLED displays are durable and free from burn-in because of its Quantum Dot technology. Samsung assists businesses in developing a new mode of purchase. Use of the hi-techinnovative signage helps with delivering an unparalleled customer experience. Samsung SMART LED Signage IF Series is available in three different models – the P1.5, P2.0 and P2.5. Samsung’s SMART LED signage features an embedded Signal Box (S-Box) that delivers superior picture quality and offers users the flexibility to expand and align screen composition scale with their promotional needs. As a result, retailers and other indoor businesses reliant on true-to-life product presentation can better drive purchase intent and improve customer satisfaction. Retailers can also integrate creativity into their promotional messages, creating an impressive brand image. The integrated Samsung MagicInfo content platform makes content creation, scheduling and deployment across the IF Series displays easier. Businesses are able to conduct remote control and management of the signage in order to save time and raise efficiency. The new Samsung commercial air conditioning 360 Cassette creates a comfortable office environment. Together with its innovative circular design, it delivers air evenly throughout every corner in any space. 360 Cassette is the world’s first circular cassette. Its innovative full-circle design blends harmoniously into any type of interior design and recognized by IF Design Award. The innovative 360 degree airflow ensures optimal air conditioning which also eliminates dead zones. The 360 degree directional wind coming out from circular heat exchanger can deliver air evenly throughout every corner in any space. Revolutionary bladeless design can minimize direct airflow for users’ comfort with its booster fan while delivering silent operation to keep the environment away from noises. o Luxurious automobile company Mercedes-Benz blended its logo with Samsung 360 Cassette in its showroom in Korea. Apart from making the showroom more stylish and glamourous, the air conditioning provides customers a comfortable and relaxing environment with its 360 degree airflow and elevate the buying experience. o Innovix Distribution, a leading technology distributor in Asia, installed over 40 Samsung 360 Cassette with their company logo in its office in Singapore. The revolutionary bladeless design creates a noiseless working environment for its employers, which helps to increase their productivity at work.